This is the first in a series of ‘Big Thinker’ blogs. The concept is simple, we select interesting industry people, ask them interesting questions and publish their interesting answers. 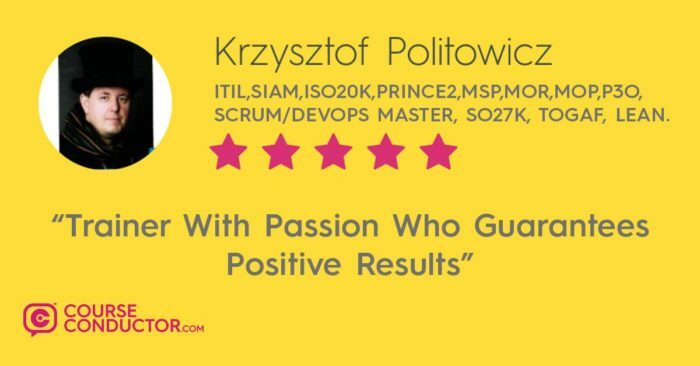 First up is Krzysztof Politowicz, a trainer from Poland who has been getting some great customer reviews on CourseConductor.com. You can read them here. Krzysztof definitely ticks the “interesting” box. Not only can he speak 3 languages but he is also certified to train 48 different course ranging from PRINCE2 to Togaf 9 back to Information Security. I’ve not heard of a trainer having that many certifications under their belt, so I wanted to ask Krzysztof a few questions about it, as well as some other industry (and non-industry) related things. You teach 48 different certifications, that’s mind-blowing to me. What is your secret to remembering so much content? Are you going to stop at the big 50 certifications? The number of certifications does not matter, if it did I would collect ISO certificates. In my opinion, the certificate confirms that you probably know something. I’ve had a driving license for 23 years, if I’m a good driver it will show on the road. The certificate gives you the right to do something. Probably the number will spontaneously increase. What’s your favorite aspect of being a trainer? Meet interesting people from all over the world, I train from Singapore to Canada, mainly in Europe and I would love to be in the US. You know how it is to stand in a classroom full of diverse glances and then you realize how we humans are like, we have the same desires, needs, dreams and all conflicts, wars, differences are from the same source of our ego and fear. I find homogeneity in diversity. You seem like a fun chap, do people have fun on your courses? It always happens when I invite students to the Marshmallow Challenge (see here: https://www.youtube.com/watch?v=H0_yKBitO8M). They all play like children. This is my biggest challenge to make adults learn through fun and enjoyment. I counted 24 people at 6.000 was unsatisfied with my training. What are the big changes you’ve noticed over the last 10 years in training? I have the impression that people were sent to training once and now they find it and they will do anything to find it. They often even pay for themselves. Classroom courses are on the decline, e-learning is taking over. How do you feel about that? I totally disagree with you, 90% of the training I run is on-site. I like these on-line but I do not have this student-teacher relationship (remember that this is dynamically changing and often I am a student so the student can teach me to learn something important). During on-line training, I can be dressed up half way up :). How will AI impact the training industry? I believe I will be getting more and more interactive online training with AI teachers, I use them myself. I have recently seen Ridley Scott’s Blade Runner and I wonder what defines humanity in the context of other species, space, animals, trees. What is the one thing you bring with you to every course? A curiosity of people, willingness to meet, openness to new experiences, sense of humor. Oops … was there only one? Let’s leave a sense of humor. What’s the biggest mistake you made as a trainer? I make mistakes every day, related to content and formal. Sometimes up to 6 times to be sure. Lean Six Sigma teaches: fail first. Errors are necessary for life and for learning. Remind Edison and his number of errors with the bulb. What is your advice to someone that is thinking about getting into professional training? You are getting some really good customer reviews on Course Conductor. How does that feel? Course Conductor is a great initiative. Until now, I have been collecting references on LinkedIn and TrustPilot. CourseConductor combines this into a whole, so thank you so much Craig. The customer reviews I receive from my students on CourseConductor.com are called my diamonds, and I value them very much. They are the best reward for my work. If you had to pick one song that represents the feeling attending one of your courses what song would it be and why? What “Big Thinker” would you like me to interview next and why? I would like to recommend to you Dee Morrissey. Dee is an extraordinary trainer. She is very very special, brave and she has a clear vision as a leader. We really need people like Dee.